The received wisdom of popular jazz history is that the era of the big band was the 1930s and '40s, when swing was at its height. But as practicing jazz musicians know, even though big bands lost the spotlight once the bebop era began, they never really disappeared. Making the Scene challenges conventional jazz historiography by demonstrating the vital role of big bands in the ongoing development of jazz. Alex Stewart describes how jazz musicians have found big bands valuable. He explores the rich "rehearsal band" scene in New York and the rise of repertory orchestras. 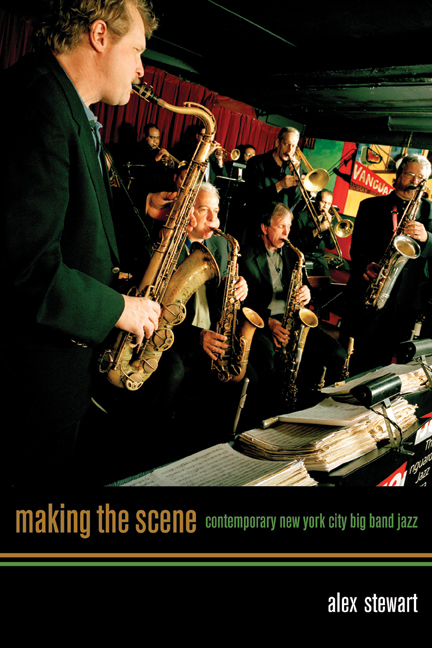 Making the Scene combines historical research, ethnography, and participant observation with musical analysis, ethnic studies, and gender theory, dismantling stereotypical views of the big band. Alex Stewart, a former freelance jazz musician, is Associate Professor of Music at the University of Vermont.